Growing up in Missouri, there were two distinct camps regarding the proper way to eat a watermelon. Salted or Plain. Now, I always thought those people who salted their watermelon were total weirdos. I mean, who puts salt on their fruit?! As it turns out, I stand corrected. Seasoned fruit is amazing. A few years after I moved to Los Angeles, the modeling agency I was working at moved from Beverly Hills to the wilds of Culver City. We had an amazing space in an old building with exposed brick, concrete floors and an entire wall of glass garage doors… in other words, an industrial modern, open-air office full of gorgeous models. I had quite a few jealous male friends, to say the least! I fell in love with our new office, but the best part of the move was having an entirely new area of town to explore on my lunch breaks. At the time, Culver City was on the up & up and hadn’t quite reached the culinary trendiness the area is known for now. It’s strength lied in the plethora of authentic ethnic restaurants strewn about the surrounding neighborhoods. Indian, Nepalese, Mexican, Ethiopian, Burmese, Peruvian, Brazilian.. you name it, we tried it. Driving back to office one afternoon, I met my destiny. Okay, so that might be a bit dramatic, but nonetheless I did discover one of my all-time favorite treats: the fruit cart! Apparently, these little beauties are all over downtown Los Angeles, Culver City and the Valley, but thanks to my sheltered existence in Brentwood, I had never seen one before. I watched the people in front of me in line to suss out the ordering procedure- specify whether you’d like a $4 or $5 serving and then choose any combination of fruits & vegetables that you want. Most of the carts I’ve been to have watermelon, fresh coconuts, pineapple, mango, jicama, cucumber, oranges, and cantaloupe. Everything you request is cut fresh to order and swept into a plastic bag. Next up, fresh key limes are squeezed over the top. Then, the piece de resistance… spicy, salty pico de gallo seasoning is sprinkled liberally on top. 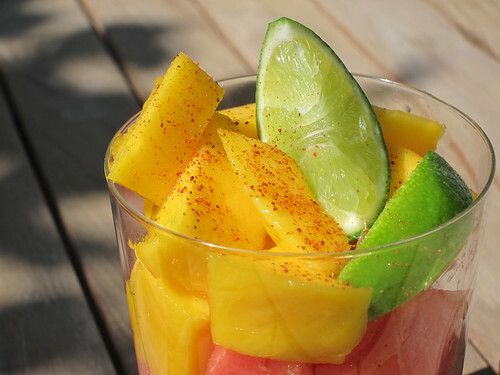 The combination of the sweet, fresh fruit with the tartness of the lime juice & the spicy chile seasoning is magical. If you aren’t lucky enough to live in a city full of fruit carts, please make it at home sometime. Pico de Gallo seasoning can be a little tricky to find if you don’t have a decent hispanic section in your grocery store, but it’s readily available online. Try it soon & let me know what you think! Very nice darlin, that pic made me crave one big time! I found your write up really good. 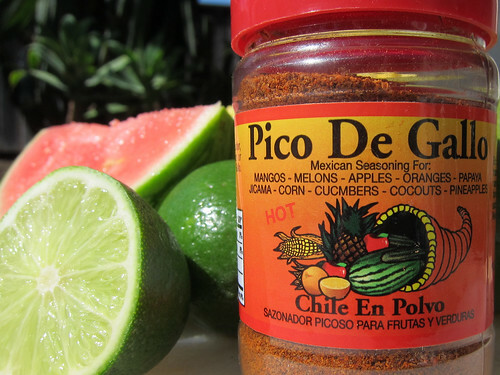 I am extra excited that you link to my website, http://www.PicoDeGallo.net Please allow me to send you a few jars of our product in a show of appreciation. The picture you use is actually a competitor of mine so hopefully you can update that beautiful picture with our jar instead. Have a great day, George.